What tickles your inner ear? Oscillates your cilia? Thrums your tympanum? 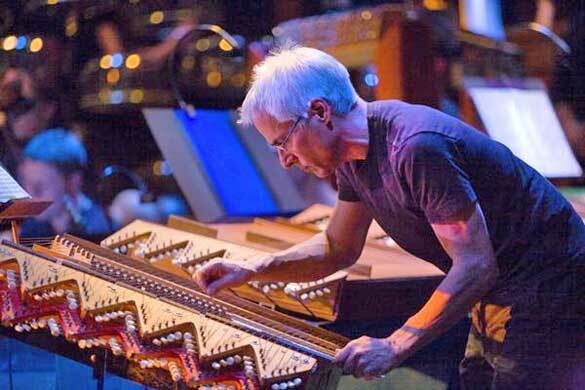 The subtly detailed microtonal music of American innovator Harry Partch seemed to turn that trick for 200 keen listeners scattered in NEC’s Jordan Hall, when Dean Drummond and Newband were front and center for a Boston Partchfest and Symposium. Seeking to create music pitched closer to human speech, Partch devised microtonal scales that reached 43-note octaves, wrote commensurate pieces, then found himself “seduced into carpentry” to create instruments to play them. Over a career (1950-74) that spanned composing, theorizing, and instrument-building, Partch drew a cult of disciples, among them Drummond, who literally lived with the instruments, which became the sole performers in Partch’s singular conservatory. Drummond led a pre-concert walkthrough of Partch’s strangely seductive, curiously attractive musical menagerie last Thursday at Jordan Hall. 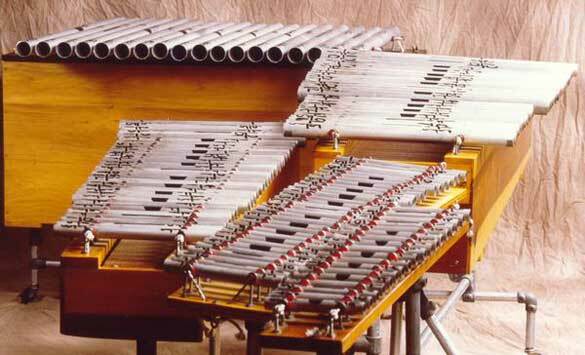 Some of the beasts: cloud-chamber (racks of sliced 50-gallon glass carboys stroked with soft mallets); harmonic canons (like Arabic qanún, 44-string flat guitars); crychord (a wooden ‘harp’ the player levers perpendicularly and ‘diddly-bows’ laterally to produce gentle glissandi); Spoils of War (a grab-bag ‘drumkit’ of sawn artillery casings; guïro, a bell-tree, small cloud-chamber bowls, bamboo rods); bamboo marimba or ‘boo’ (a trapezoidal clump of 60 hollow bamboo rods); diamond marimba, (an instrument that aligns like sounds by location, not unlike a steel drum); and zoomoozophone or ‘zoo’(a wide marimba of aluminum rods). The concert’s scant hour of music was formatted atypically front-heavily: before intermission came three solid 10-minute pieces for chamber band (seven to nine players) by disciples, and after it two softer, wispier, timbrally detailed chamber works (voice and two to seven players) by the master. Drummond’s Before the Last Laugh (1995) touched on slithery Debussy lines and a Schoenbergian march before breaking into a fantasy of dazzling interplay for marimbas and canons; then, in a “strange meets familiar” filmic moment, the piece morphed into ominous funhouse whoops and tense gamelan shimmers with cymbals and bongos. Matthew Rosenblum’s Yonah’s Dream (2008) began like fuzzy neo-Noh drama, with Newband co-director Stefani Starin slurring flute microtones like a shakuhachi and Charles Corey hammering a surrogate kithara that somewhat mimicked a koto. Fascinating surreal textures, almost tactile, wedded with subtly gradated melodies, and soft mallets on two to three marimbas introduced a rocking beat that evolved into a fixed martial, then syncopated, 8/8. For Congressional Record (1999), Drummond mined ‘howler’ readings from the Senate floor (eg, Jesse Helms condemning the NEA) for Robert Osborne’s bawled baritone screed, limned by phantasmagoric marimba in sweeping glissandi. In a powerfully echoing, humming drone towards the climax, the ‘zoo’s overtook the ‘boo’s, and dissonances somehow became consonant. A dynamic shift became palpable after intermission, during which a few audience members approached the stage for a closer look at this magnificently delicate bestiary of wood, gut, metal and glass. Partch’s Eleven Intrusions (1949-50), the evening’s showpiece, opened with two earthy, stately Greek dances for harmonic canon and bass marimba, and thereafter showcased only an instrument or two – usually guitar and diamond marimba – to underpin Osborne’s resonant baritone as he ‘intoned’ poignant poetry. A rousing finale at last summoned the ensemble, as seven musicians joined Osborne in a ritual Zuni Indian Cancion de los Muchachos. At times, we felt captured by the hushed primal rattles and twangs, the overall effect inducing meditation or invoking ghostly etched palimpsests or Rashomon shades. Sara Engle, 14, called the music ‘otherworldly’, that it made her think of mythology. See companion review here and related article here.